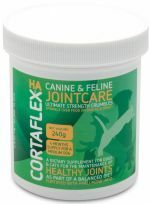 Canine and Feline CORTAFLEX HA ULTIMATE STRENGTH CRUMBLES are fortified with Hyaluronic Acid, a major component of joint lubricating fluid. Available in a 240gm tub. Your pet has never been in better hands. We’ve combined the most essential ingredients at the highest grades possible, all packed into sprinkle capsules so you can subtly mix into meals. Just sprinkle and mix the contents of the capsules into your pet’s meal according to their breed and size. Premium grade Turmeric Extract (95% Curcumin), Boswellia Serrata Extract (65% Boswellic Acid), Vitamin C and BioPerine® (Black Pepper Extract) have been added to what is already a highly advanced Glucosamine Complex. Wear and tear can be exaggerated by breed conformation and growth spurts. Feed young animals, especially those breeds with associated weakness, Canine & Feline Cortaflex as part of their daily routine to support healthy joints for life. An affordable maintenance supplement for cats and dogs. To prolong joint mobility, feed Cortaflex Joint Care fortified with Hyaluronic Acid, a major component of joint lubricating fluid. Available in 160gm size for extra value. Canine and feline joint supplement for joint mobility in a powder. 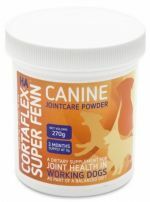 We have combined our premium Cortaflex® HA with Super Fenn, a natural anti inflammatory, to support sound joint health and provide your dog with joint comfort and to support mobility. Available in a 270g pot which is a 3 months supply for a large dog on one scoop a day. 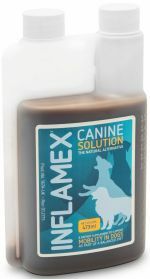 Canine Inflamex Solution - Nature's Alternative containing Botanical Extracts. 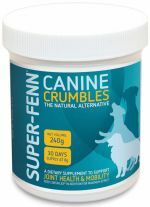 Canine Super-Fenn with Turmeric, Yucca and Bromelain is a powerful formulation of natural anti-inflammatories and pain killers, with no known side effects. 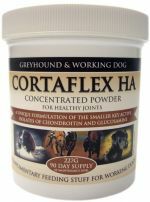 Fed by the blood stream Greyhound & Working Dog Cortaflex HA will target every joint in the skeletal system and will begin promote healthy joints that are experiencing hard work. A complimentary feed supplement to maintain and assist movement of healthy joints in working dogs. Quick and easy to feed, it provides the smaller KEY Actives of Glucosamine & Chondroitin, with the addition of Hyaluronic Acid to maintain healthy joints regardless of age. Available in 227gm size for 3 months supply at maintenance. a moist epidermal environment with the ability to help clean and deride necrotic tissue, encourage natural hair re-growth and maximise skin smoothness. Derma Gel does not contain steroids. DERMA GEL SPRAY 50ml - The number one herbal skin hydrogel, for intensive and rapid skin care, plus a protective barrier effective against foreign contaminants. Derma Gel provides and maintains a moist epidermal environment with the ability to help clean and deride necrotic tissue, encourage natural hair re-growth and maximise skin smoothness. 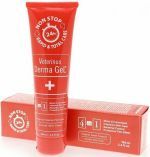 Derma Gel does not contain steroids.